Prevention of global warming has become an issue in recent year, and industry is turning more and more toward stricter energy savings policies and the use of renewable energy. On the consumer end, the selling of Energy Star appliances, the making of energy saving laws, and other measures are being taken to reduce power consumption, and various techniques are being used such as the running of home electronics in energy saving modes. The WT310E can measure such a small range 5mA . Small current input: 5mArms Range. Simultaneous Harmonics (DC-50th order) and Total harmonic distortion (THD) can be measured. Wide range communication interface USB,GP-IB,RS-232, or Ethernet. 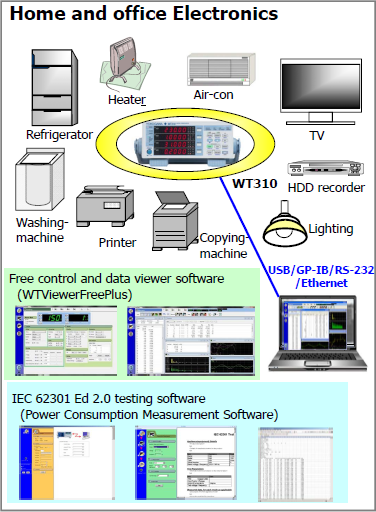 The Power Consumption Measurement Software together with a WT310E (or another WT series) offers trustworthy power measurement solutions to test household products and office equipment for standby and off mode power.